My boys are big Thomas & Friends fans. We’ve been watching the show and collecting the play trains for years now. I like that the show always has a good lesson for the boys, whether it’s about teamwork or telling the truth, there’s always something good to take away from each episode. I also like that it’s one of those shows that you don’t have to worry about bad language or scary scenes. It’s truly a series that’s perfect for all ages. The toys are pretty fun too – there are different sets to collect, different tracks to build, and, of course, lots of trains! My boys were ecstatic to find out that we were going to have the chance to not only review a new Thomas movie, but also a new Thomas toy! 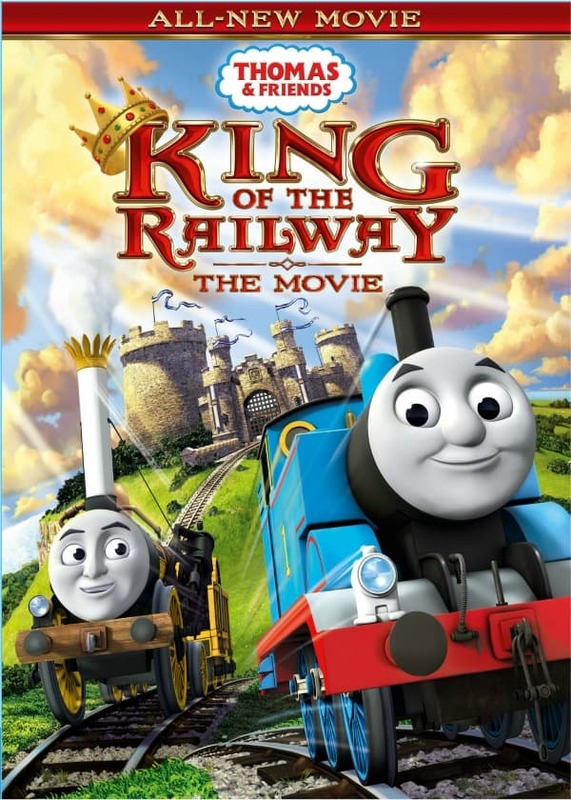 We were sent a Thomas & Friends: King of the Railway DVD along with a Thomas & Friends Trackmaster – Quest for the Crown play set for review. We started out by watching the movie, and I have to say that I was as captivated with it as my boys! The story begins when a special guest arrives on Sodor with a big surprise and important jobs for Thomas, Percy and James. The engines go on to meet new friends and discover suits of armor, coats of arms and legends of long-ago train heroes and a very special golden crown. Then their bravery is put to the test when their new friend Stephen goes missing. The movie has some great music and held the attention of my two boys right to the very end! It was great to sit and enjoy this movie as a family. This movie runs for 62 minutes and can be found at retailers like Target, Walmart, Barnes & Noble, and Amazon.com. The single disc version I received is currently selling for $12.96 on Amazon. 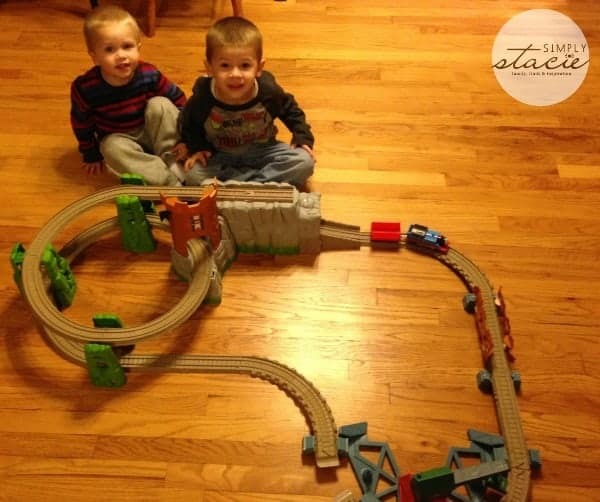 The Trackmaster Set was an instant hit with both of my boys. 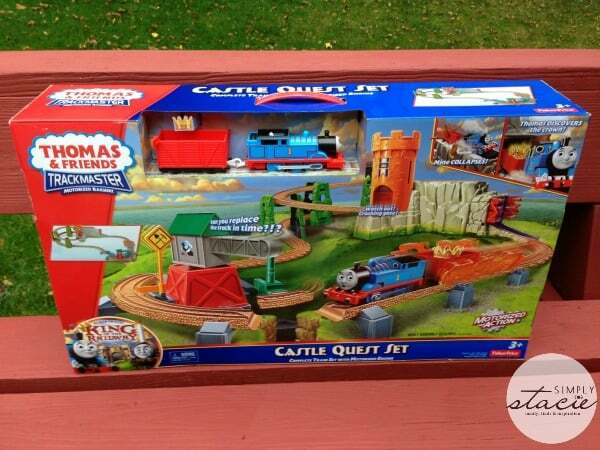 This set is inspired by the King of the Railway DVD and sets Thomas on a quest to find the missing golden crown. What makes this set unique are the pitfalls that make you think Thomas just might not make it to his destination. My boys loved watching Thomas make it through some close calls on the track, and especially loved when Thomas dropped down into the caves and came out with the crown! 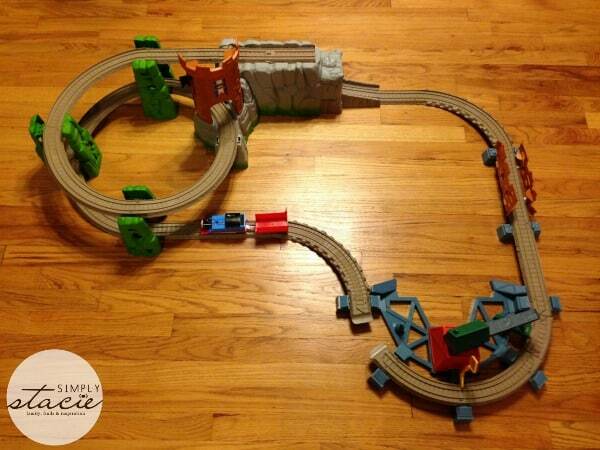 Both of my boys love playing with this set and spend some great time together watching Thomas on the track. I love that this is something they both can enjoy together. This set has a suggested retail price of $59.99 and can be found at the same retailers as the DVD. If you have a Thomas fan at home, the DVD and play set would make a great birthday or holiday gift. You can find Thomas & Friends on their website, on Facebook, Twitter, and YouTube. This is such a perfect gift for a young child.It stimulates imagination and is much more than just a toy. My son loves Thomas and friends, great idea for a Christmas stocking stuffer! This would be perfect for any wee one to find under a Christmas Tree! Thanks for the review! The Thomas and Friends movie and the trackmaster is such an awesome to own.My nephew loves this stuff and he would love to get it for Christmas. Great story and fun to play! I remember playing with trains myself! What a fun and creative toy. We love Thomas movies! I have always loved Thomas the train and watched it on TV years ago. I’m sure my grandchildren would love watching the movies and playing with the Trackmaster Set – Christmas is coming soon.